A memorandum from Colonel H. M. Rund, the Assistant Adjutant General in the U.S. Army, to General Henry H. Arnold (1886-1950), the Commanding General of the U.S. Army Air Force (USAAF). 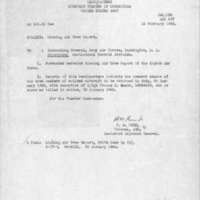 In the memo, Col. Rund informs Gen. Arnold that all but one member of an air crew previously reported missing had been returned to duty on January 28, 1945. Staff Sergeant Thomas E. Eason (1922-1945) was reportedly killed in action on January 20. SSgt. Eason served for over three years in the U.S. Army Air Forces' (USAAF) 569th Bomb Squadron of the 390th Bomb Group, as a waist gunner on a Boeing B-17 Flying Fortress nicknamed "Sweet and Lovely" and "Princess Pat." SSgt. Eason completed 28 missions in both the Pacific and European Theaters of World War II. On January 20, 1945, he was killed near Altenheim, France, after his airplane was shot down by enemy combatants. Over the course of his service, SSgt. was awarded the Distinguished Flying Cross with two Oak Leaf Clusters. 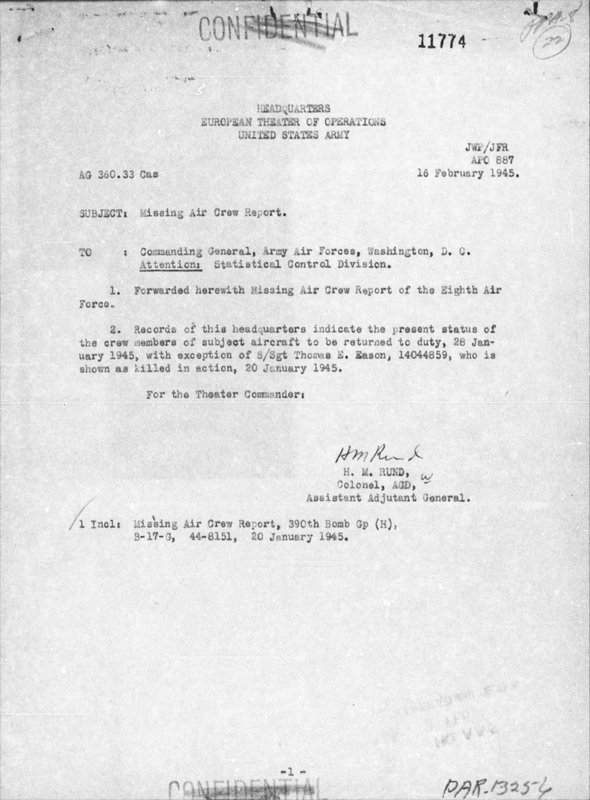 Digital reproduction of original 1-page typewritten memorandum from Colonel H. M. Rund to the Commanding General of the U.S. Army Air Force, February 16, 1945. "Missing Air Crew Report for the 390th Bomb Group's 569th Bomb Squadron." RICHES of Central Florida. Originally created by H. M. Rund. Rund, H. M.. “Memorandum from Colonel H. M. Rund to the Commanding General of the U.S. Army Air Force (February 16, 1945).” RICHES of Central Florida accessed April 21, 2019, https://richesmi.cah.ucf.edu/omeka/items/show/9300.